"Let me know how I'm doing!" "No, really, you can share everything that's on your mind!" I wasn't buying it. I mean, you're telling me that I can say what's on my mind, good or bad? It turns out, the ability to give and receive feedback makes a big difference for people. It helps build stronger relationships, improves communication, helps recognize the great work people do and supports them in areas where they need some assistance. We also know this is all easier said than done. After all, some people just don't get it. An eBook with tips on how to give (and get) feedback: Learn the right way to communicate and share information to help build strong relationships, improve communication and increase productivity. A webinar on how to hold great performance conversations in just 10 minutes a month: This webinar is designed for managers. It provides three key steps to help have great performance conversations so managers can have meaningful discussions with employees about their performance, learning and development, and career goals. Feedback templates to help give feedback: Need some ideas to help get your feedback train rolling? These templates offer some helpful do's and don'ts on how to give helpful feedback in all situations (even the ones that make you squirm). Our guide includes real-world examples that show how to have conversations with people and really help them succeed. You'll also learn how to make employee recognition meaningful, and get creative ideas you can use to show employees they're valued. Early in my career, I didn't know how to give or receive feedback. That explains my Dr. Evilesque reaction. I thought the whole thing meant giving people a high-five when they did a good job and burying the feelings that made me boil on the inside. It turns out, there's a right way and a wrong way to give and receive feedback. You deserve feedback. Your boss deserves feedback. Your coworker deserves feedback. 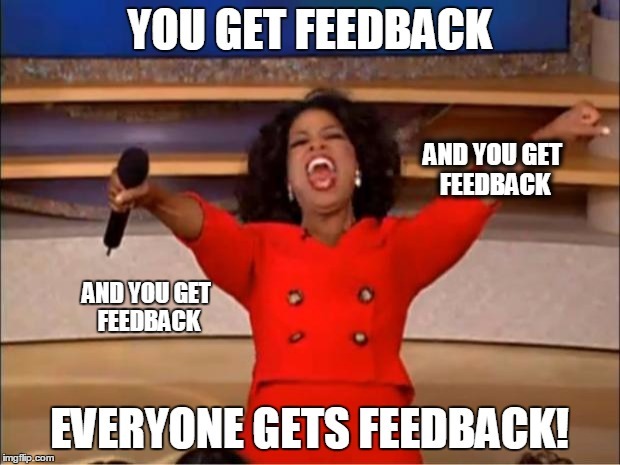 EVERYONE deserves feedback! Elias is passionate about storytelling and finding creative ways to put HR and talent management in the middle of a conversation. From his perspective, every person and every brand has a story to tell, and Eli strives to find creative ways to tell that story and share it with the wider world. He is the former Manager for Public Relations at Saba. Eli earned a B.A. in Canadian Studies and Mass Communications from Carleton University and a post-graduate certificate in Public Relations from Humber College. In his spare time, Eli enjoys playing and coaching hockey, spending time outside with his family, reading magazines and re-watching the Rocky series from start to finish. Oh, and cheering on the Montreal Canadiens.